yiannis krikis (thessaloniki, Greece) on 26 April 2008 in People & Portrait and Portfolio. Very nice. The ornate walls are remarkable. beautiful capture, love the moody light! Magical, totally wonderful, my fav!!! Beautiful. Just beautiful. Full of the lives of people. i love the expression on the man's face in the center of the photo--weary, somewhat sad. that he's turned away from the rest of the crowd, with his back to the (saint? jesus? )( portrait on the wall behind him, perhaps prtends some symbolism here. excellent image, yiannis! Really like how ornate the walls are here. Great tones and composition. A very powerful image saying much about continuity from the past that is still there to be found if only we chose to look. 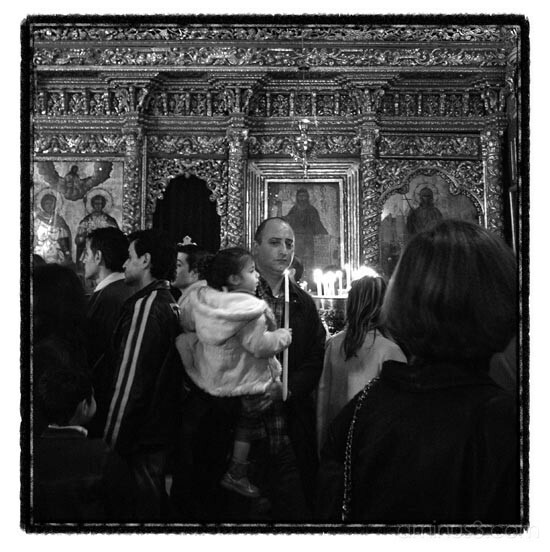 The most beautiful masses i have attended in my life were in Greece and especially during Easter. Thanks for helping me here to remember.